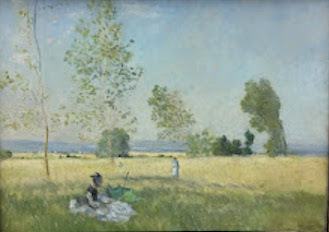 Summer, oil painting by Claude Monet, exhibited at the Alte Nationalgalerie in Berlin. Depicting a tranquil countryside scene with a women sitting in a cool shadowy foreground, against a background in the summer heat with wind-blown trees. Most probably painted while spending the summer of 1874 in Argenteuil, along with Renoir and Manet.